Following on from previous years, the Annual Tour was another resounding and enjoyable success. Travelling in the luxury of a Creigiau Travel coach the tourists lunched at their Llandrindod Wells hotel before making their way to match one at a damp Knighton Bowling Club. The green, just yards from the English border, was in excellent condition despite the recent rain. Three rink wins saw Pentyrch record a welcome match victory followed by tea and banter in the Knighton Club house. The top Pentyrch rink was skipped by Barrie Thomas, while the unfortunate poorest rink was skipped by Tim Morgan. Saturday - and a return to an old foe at Newtown Bowling Club. Treated to the town carnival and silver band before hand, the tourists were no match for the hosts who ran out comfortable winners, despite victories on the rinks of Jan Berry and Mark Krawiecki. Margaret Farmer's rink won the dreaded Black Sheep for their losing efforts. 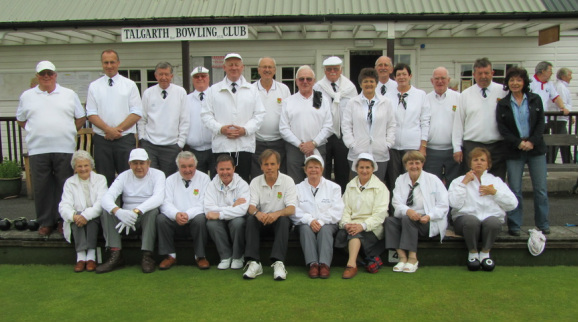 Sunday - a superb lunch at the Honey Cafe, Bronllys was followed by the final tour match at Talgarth Bowls Club. Pentyrch repeated a victory of 5 years ago recording their second win of the weekend. Alan Parsons skipping the worst losing rink, and Ian Broxton claiming top skip on the day. An excellent bowls tea in the Talgarth club house sent the tourists happily on their way for the short journey home. The very popular winners of the Tourist of the Year trophy were husband and wife team Myra & Howard Thomas who contributed immensley behind the scene in the hotel and on the coach, and yet again provided the entertaining quiz.